It's easy to record a document onto the title of a real property. Typically one needs only to have the proper form of a real estate document — a "conveyance of ownership" instrument, a mortgage document, a lien form, a power of attorney, an affidavit — and the appropriate legal information about the property, access to a notary's approval (or just a notary's stamp or seal) and filing instructions for the county recorder's office (or comparable office in your local jurisdiction). Then, bingo, the document can be filed and recorded with no verification of the truth of the information it asserts. Easy filing — coupled with no need to verify the filing's substance — enable significant, varied and lucrative frauds. Within six months, the Hennepin County Attorney's Office (HCAO) in Minneapolis, Minnesota, charged two separate defendants with various criminal offenses in which false filings of documents at the county's registrar of titles/county recorder's office played significant roles. In part one of this two-part article, we'll examine the peregrinations of one Trevor "Bam-Bam" Baker — a financial crime generalist and all-around tiresome individual. In part two, we'll examine the specialized antics of Rory Sykes — whom I call the Lizard King of Foreclosure Fraud. Although their schemes were different, their common playground was the county recorder's office, and their respective hauls were substantial. Trevor Baker was a 6'6" bruiser of a self-styled home builder/renovator and all-around real estate whiz in Hennepin County. Before he discovered the fraud potential in real estate, he worked for a national investment house as a sales and executive investment trainee and learned the logistical operations of this and similar companies. He later became a mortgage loan officer and a commissioned notary public in the mid-2000s. His bar buddies gave him the nickname Bam-Bam, for reasons that faileth human understanding, and so that's how investigators and prosecutors later referred to him. Bam-Bam had eight business entities registered in three states: Lucerne Capital L.P., Lucerne Builders, Lucerne Group, Marketech Investments Inc. (two entities with the same name), Geneva Capital L.L.C., Geneva Trust and Geneva Capital Trust. Remarkably, all of these entities operated out of a post office box the size of a toaster oven at a UPS outlet in a Hennepin County suburb known for its higher median incomes and relative transience. Bam-Bam listed himself variously as the "qualifying person," "general partner," and "director of investments" for these entities. Bam-Bam also had a mother, Pamela, who had some business integrity "issues"; an honest grandmother, Edith; a soon-to-be ex-wife, Melissa, who had a healthy income and an increasing contempt for Bam-Bam; and a soon-to-be ex-brother-in-law, Dennis, whom Bam-Bam could easily manipulate. Melissa's contempt for Bam-Bam was well-founded. For although Bam-Bam had all of these wonderful business entities, Melissa never saw him build or renovate anything unless it was a residence in which he lived. He bought, built or renovated these residences by fraudulently obtaining large loans, and he facilitated these loans by regularly filing false documents with the county recorder's office. In just 1½ years, Bam-Bam filed seven fraudulent warranty and quitclaim deeds on a single parcel in the same city as his toaster-oven-sized office. (A quitclaim deed transfers the owner's interest in a parcel of real estate to another with no warranties of the status of the property title.) These transfers of title bopped ownership of the parcel back and forth among "XXXX Trust," Bam-Bam, Geneva Trust, Geneva Capital Trust, Melissa and his grandmother, Edith. Melissa and Edith never knew they owned this property. On the strength of these fraudulent filings, Bam-Bam got five mortgage loans for this one parcel, including three traditional 30-year loans and two home equity line of credits (HELOCs). Two of the loans — totaling $863,800 — were in Melissa's name, and three (including the HELOCs) were in the name of Grandma Edith — totaling $1,060,000. Not only were the conveyances fraudulent, but the mortgage loan application files also contained numerous fake financial documents, bogus incomes and other misrepresentations for the purported (and clueless) mortgagors, Melissa and Edith. Somehow, Bam-Bam acquired another property in a different, fairly affluent suburban city in Hennepin County. He might actually have renovated part of this property. And Bam-Bam exercised a tad more restraint in his fraudulent real estate filings at the county recorder's office, specifically two quitclaim deeds: one conveying the property from his mother Pamela to Melissa and the other conveying the property from Melissa and Bam-Bam as husband and wife to Lucerne Capital L.P. He then filed a fraudulent Statutory Short Form Power of Attorney (POA) in Melissa's name in which he designated his malleable now ex-brother-in-law Dennis as attorney-in-fact for Melissa. Bam-Bam then used Dennis to attend a closing for a mortgage loan of $1 million in which Melissa unwittingly "bought" back the property from Lucerne Capital L.P on the strength of the latest quitclaim deed and the Short Form POA. In addition to all of this, Bam-Bam stole his grandmother's identity to obtain $766,000 in mortgage financing on yet another whopper of a property he was building for himself. He also stole funds from a checking account Melissa had solely in her name. Bam-Bam couldn't stop himself. He then stole funds from Melissa's 401K account by having his mother, Pamela, pose as Melissa and call in a request to the 401K custodian for a rollover to another qualified account. He also stole Melissa's identity to fraudulently lease almost $65,000 worth of home furnishings for the whopper house. A true Renaissance man of fraud was he. Melissa and his grandmother eventually ratted out Bam-Bam to the police by reporting his thefts of their identities. 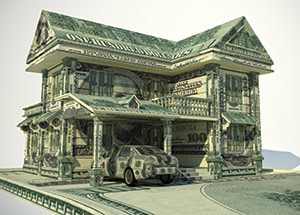 As often happens in financial crimes, the case spider-webbed far beyond the initial allegations, and eventually investigators identified Bam-Bam's fraudulent real estate filings as a critical part of his schemes. Bam-Bam was subsequently charged with two counts of racketeering, five counts of theft by swindle over $35,000 for the fraudulent mortgages, two counts of identity theft over $35,000 and two counts of theft by swindle over $2,500. He was convicted on three of the theft by swindle over $35,000 counts, sentenced to a 45-month prison term and later supervised release. His sentence ended in April 2014. Bam-Bam was clearly a fraud gadfly for whom the filing of false real estate documents was but one of many techniques in his wheelhouse. In part two, we'll turn our attention to our Rory Sykes, a foreclosure process expert whose dark talents were even more subtle and long-standing than his 6'6" alter ego. And we'll wrap it up with some tips and takeaways for this type of real estate fraud.